Can be used both internally and externally. Use for warts, infections and congestion and as natural antibiotic. 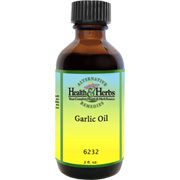 Garlic oil aides the body by lowering blood pressure, fights infections as well as builds the heart muscles. Garlic Root, Cold-pressed Olive Oil. Garlic Oil is shipped in a discrete, unmarked package. Orders are processed immediately and usually take about 3 to 5 working days to be received. Any information received is used only for order processing and shipping purposes. Your information, such as e-mail address, will never be disclosed to a third party.